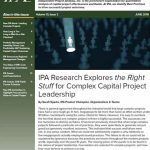 New IPA research takes the guesswork out of hiring, assigning, and developing complex project leadership, by linking individual attributes to project outcomes. Written by Edward Merrow and Neeraj Nandurdikar, Leading Complex Projects gives readers an in-depth look at the quantitative links between individual project manager characteristics and project results. For sites that plan and execute sustaining capital projects, the practice of regular benchmarking helps to address problems quickly or avoid them altogether. IPA surveyed portfolio management leaders to understand why predictable and consistent outcomes are so difficult to achieve for E&P sustaining capital projects. Effective July 1, 2018, IPA’s Paul Barshop moves from Director, IPA Capital Solutions to become Regional Director, Asia-Pacific. Rolando Gächter moves from the Asia-Pacific role to Director, Middle East Development.